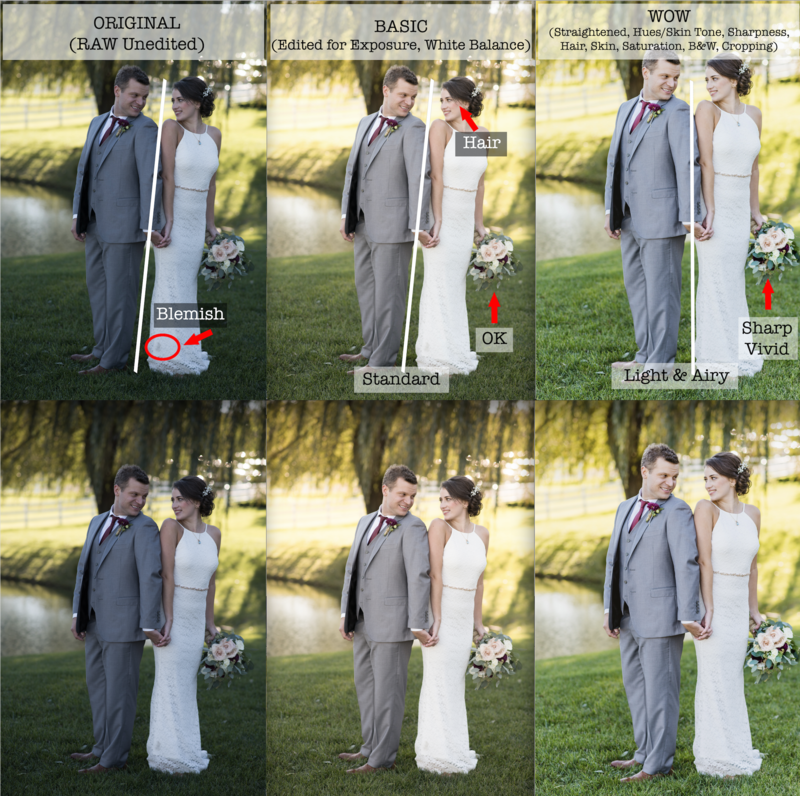 As necessary and appropriate, images are edited from ORIGINAL in-camera originals which contain lots of information in RAW format. The RAW original file is not optimized and does not render properly on a camera screen or at the start of editing (camera manufacturers and software algorithms affect the rendering), Once downloaded, the image is either culled, or preserved, then given BASIC editing which may include adjustments to exposure, white or color balance (to compensate for ambient lighting) and possibly other variables based solely on the artistic judgement of the photographer. The image is then rendered in high quality JPEG format capable of printing at 8X10 and possibly up to 16X20. Clients may request higher resolution for larger products, prints, or canvases, but these are provided on a limited and case-by-case basis as the files are extremely large and unnecessary for virtually all purposes. Images with BASIC editing are provided to the Client for selecting their favorites (amount of favorites varies by package and contract specifics as each image edited requires several minutes of adjustments and is not applied to all images). Once the favorites are selected, the photographer may apply additional adjustments (again, based solely on the discretion of the photographer’s artistic and professional judgement) which may include straightening of the image, cropping, hues and luminance for skin tone enhancements to make the skin look natural and not orange, pink, purple or green, highlights and shadows, clarity, vibrance and saturation, noise reduction, limited removal of blemishes or spot corrections, conversion to B&W, “digital plastic surgery”, other special effects, etc. The adjustments to the favorites are called “WOW” and are delivered to the Client and used for any product ordering. The collection of WOW images are used as the source material (most are used) when designing a wedding album. The bottom three images are the same ones on top, except without the notations. 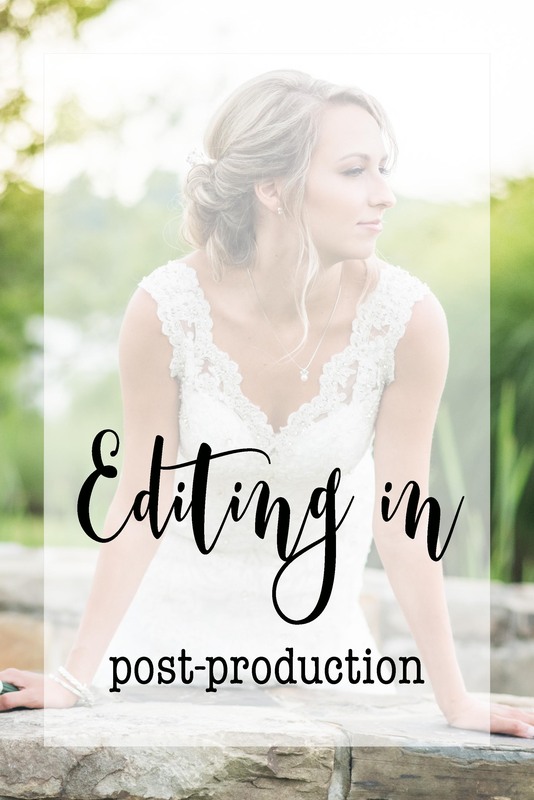 I hope this was helpful to you in getting a better feel for the effort involved in post-production editing and making your good photographs even better! NOTE: It is important for Clients to remember that photography is an art form and while the photographer will entertain ideas and suggestions for editing from the Client, any image manipulation or adjustments is the sole discretion of the photographer. The photographer does not guarantee the quality of the original, intermediate, or final images as quality is a subjective opinion and photography is affected by many variables such as the intensity (or lack) of lighting, type and combination of lighting, lenses, movement by photographer, subject or background, strobes or video lights, shadows, time of day and sun location, foreground and background lighting and exposure separation, black-white-color contrasts, natural or man-made or human interferences, weather, topography, room size/configuration and availability to capture wide angles, and many other variables.